The Canadian percussion group NEXUS announces the departure of founding member Robin Engelman. Robin Engelman, one of the founding members of NEXUS, resigned from the group in December, 2009. Active for over 38 years with the ensemble as performer, composer, arranger and conductor, he made the decision to step down due to on-going vision difficulties. 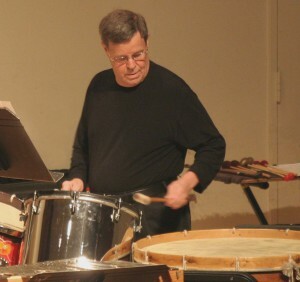 Robin’s distinguished career also included principal percussion positions in the Milwaukee Symphony, Rochester Philharmonic, and Toronto Symphony, as well as pioneering work with Toronto’s New Music Concerts contemporary music ensemble. His inimitable performance style, musical conception, and sharpness of thought and expression helped define the character of NEXUS since its first concerts in 1971. Although NEXUS is sad to see Robin leave the group, there continues to be lots of excitement about the future. The ensemble has new commissions pending, and, as always, has new works and projects in progress by its members Bob Becker, Bill Cahn, Russell Hartenberger and Garry Kvistad. Rather than try to replace a lifelong friend and unique colleague, NEXUS will carry on playing a mix of quartet and quintet repertoire, working with a variety of guest artists and soloists. The group recently co-commissioned and will give the Canadian premier of Steve Reich’s new Mallet Quartet in April, 2010, and will continue to play solo and concerto concerts, including performances of their signature piece, Toru Takemitsu’s From me flows what you call Time with orchestras in Japan, Texas and New York during the 2010 – 2011 season. Their next solo concerts will be at the Sean O’Sullivan Theatre in St. Catherines, on March 19, and at the Glenn Gould Studio in Toronto on March 20, 2010. Congratulations to Robin upon his retirement from NEXUS. This will be the end of a great era for the group and I wish them continued success. I know Robin will continue to be a mentor and leader for the percussion community for many years to come, and I for one will miss seeing him on the stage with NEXUS. teaching high school music – a good run due largely to Robin’s influence. Good luck to you Robin!